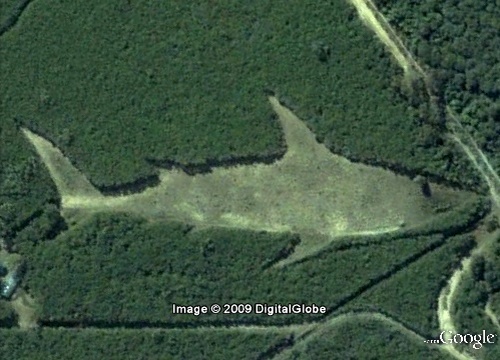 This Giant Shark near the Old Bar Beach, Taree, New South Wales, Australia was first spotted in Google Earth by Google Earth Community member jemmerton (Jeff Emmerton). He made just a solitary post in November 2006 and disappeared from the forum. No details about this 250 metres long giant shark carved out by clearing of shrubs/trees is available. Some have speculated that perhaps it is work of Greg Norman, an Australian professional golfer and entrepreneur. He is nicknamed, The Great White Shark or sometimes simply The Shark. Shark is also his brand logo. Others think that it was created by local 'Biripi' aboriginal people and is a symbol of their culture. I'm moving to Old Bar Beach next week, we'll have a walk down and look at this, it's just to the North of the nearby village of Wallabi Point. I'll also have an ask around the village and see if they know what it represents. Thanks Michael. I will be looking forward to result of you investigations.